Each September children begin a new adventure by becoming ‘big kindergartners.’ These first steps into the school environment are a milestone in social and cognitive growth. For many five-year-olds, this step is met with confidence and excitement. For others, the first day of kindergarten may be overwhelming and filled with anxiety and dread. But what quantifies school readiness? And how can we as a community support families so that all children are prepared for the transition into school and a future of academic success? 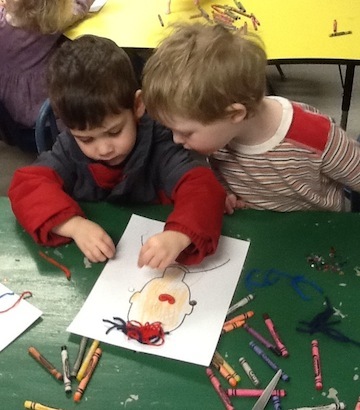 The developing child needs time to practice peer interaction. Russian psychologist Lev Vygotsky (1896-1934) believed that “social interaction precedes development; consciousness and cognition are the end product of socialization and social behavior…He states: “Every function in the child’s cultural development appears twice: first, on the social level, and later, on the individual level; first, between people (inter-psychological) and then inside the child (intra-psychological).” (McLeod, 2007). Megan Smith is a private daycare provider and mother of three. She takes advantage of the story hour each week with the children in her care at the public library. When asked if she uses a curriculum in her home service to children, Megan hesitates. “At first I was very organized and structured. We had circle, art time, reading and the like. When things didn’t go ‘as planned’ as sometimes happens with toddlers, I became stressed that I was not getting it done! The more laid back I have become in structure, the better it is for the kids because they are able to get what they need from me as they learn from interaction and play.” (M. Smith, personal interview, April 2013) Megan recognizes the library story hour programs as a precursor to the preschool structure and school environment. She enjoys the relaxed atmosphere for the children with just enough structure for learning while broadening their social connections. What are teachers and special educators seeing or not seeing as children are entering school for the first time in September? What are the challenges? “There are many interpretations of what constitutes ‘readiness.’ Vermont’s concept of children’s readiness is multidimensional; it includes social and emotional development, communication, physical health, as well as cognitive development, knowledge, and approaches to learning (e.g., enthusiasm for learning, persistence, curiosity).” (Vermont Agency of Education, 2013) The charts below show that while student enrollment is in decline, student disability count is rising within classrooms across the state. Located in Orange County, Bradford serves as the economic center for the immediate region. Bradford’s poverty level, especially the village area within the vicinity of the library, is higher than the state average and significantly higher when considering families with children. The neighborhood from which we get a number of walk-ins to use library services is one of the highest concentrations of low-income families in this area. Kindergarten and first grade teachers at the Bradford Elementary School put independence and self care as the biggest challenges for most children entering kindergarten. Independence is followed by an eagerness to learn and ask questions. These educators express concern over the number of children without access to the benefits of suitable preschool and daycare facilities. For children who are not exposed to preschool or other social connections, the library offers an excellent opportunity to nurture this piece of development in children. At the public library, families and especially young children living in rural Vermont have access to peer socialization and cognitive developmental support through early literacy programs such as story hour, summer reading programs and more. Working closely with the schools, the library programs are designed to not only promote a love for reading but to nurture life long learning skills and support academic success. Films Media Group. (1990). Five to eight [H.264]. Available from http://digital.films.com/PortalPlaylists.aspx?aid=6842&xtid=25003. This entry was tagged Bradford Elementary School, Bradford Public Library, Bradford Vermont, Kindergarten, Lev Vygotsky, Orange County, peer socialization, poverty level, school readiness, special education disability count, story hour. Bookmark the permalink.